VentusAV is a revolutionary new platform in the Private Aviation Charter Market that uses cutting-edge technology to bypass the traditional broker and connect the Customer and Operator directly. 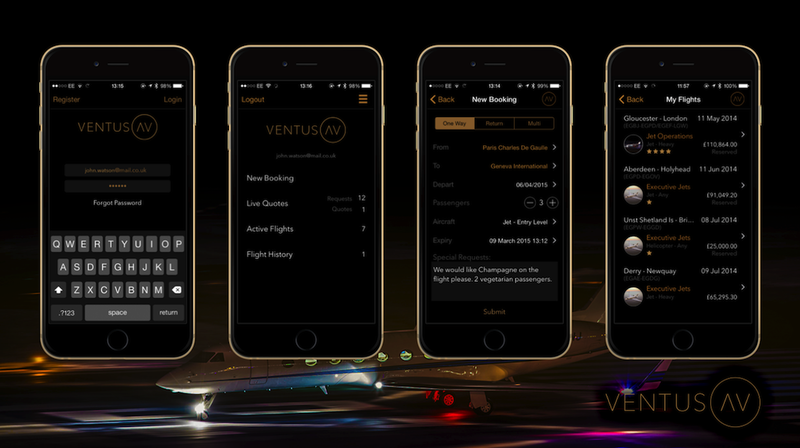 Ventus wanted a premium branded iPhone app and equivalent website that would be simple to use, taking the user right through from requesting a flight to the completed booking. In addition, they wanted a web portal to allow the operators to respond to the bespoke flight requests from customers. Timescales formed a critical part of this project, in order that the app be delivered in good time for the Ventus team to take the app to an air show to attract investors. Pyrotechnic Apps worked with VentusAV Ltd to develop a new app for the Private Aviation Charter Market. We worked with the team at Ventus from the initial concept right through to having the product ready to show to investors.